Bravado Essential Nursing Bra Tank NOW 30% OFF! Special Feature: As illustrated in the picture this tank top has a full bra incorporated into the one piece style. The most unique feature is that it comes up to an F/G size range which no one else has done! This style works by itself in the summer but is great for layering year round. The one drawback is that it is a little less discreet than some styles as the whole breast is exposed when you pull the cup down. But the positive is that there is more skin to skin contact! Fabric Content: 90% Cotton, 10% Spandex. Colors: White, Black, Chocolate, Suede Blush (darker pink), Dark Plum, and Tiger Lily . 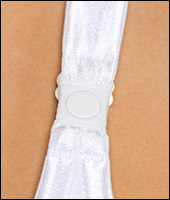 Sizes: B/C combination cup comes in band widths 34-38, D/E cup comes in 32-44 bands and F/G comes in 32-44. Special Sizing Tips: Just as their traditional bra is not really a full G cup don't expect this to be any different but at least it is a better choice for those larger cup sizes!